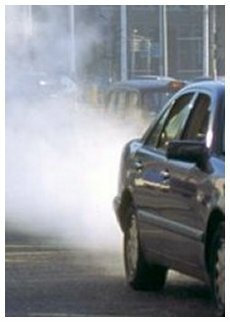 Urban legend says that in a single trip of 100 miles or so your car will burn more oxygen than your body will burn in a life-time. With a few simplifications, and your factor-label skills we should be able to prove or disprove this idea. 2. Round trip distance to Pyramid Lake and back (gotta go fishing once in while) 116 miles. 3. Gasoline has an average composition of C8H18 (isooctane). 4. Assume complete combustion (products are CO2 and H2O). 6. Assume atmospheric pressure is 650 mm Hg. Assume it is a mild winter day 10 C. for a temperature. 8. The average number of breaths is 15 breaths per minute. 9. Human lungs are about 13% efficient. We return about 87 % of the O2 we breathe unchanged. General approach: figure out how much O2 the truck needs for the round trip. Find out how long it would take an adult to breathe that much O2. If you are interested, e-mail or hand Mr. K your worksheet for up to 100 points of extra credit.